The Google OnHub was launched one year ago with a lot of implicit promises about smart home functionality. We never saw any of that materialize, though the router has gotten more capable. Now there's finally some smart home integration happening in the form of a Philips Hue partnership. Oh hey, guess what still doesn't work. Yep, the USB port. The Hue functionality is enabled by the latest version of the OnHub app, which you can get on APK Mirror. Here's the changelog. 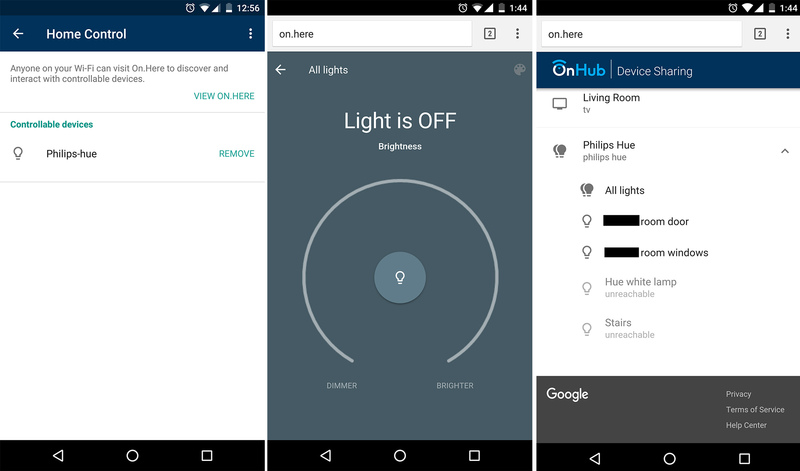 Home control and Philips Hue lights: Set up control of your Phillips Hue lights in the app, then anyone connected to OnHub can enter "On.Here" into a browser and see the devices you’ve made available. Philips Hue is the first connected home device that can be accessed and controlled directly from On.Here. No need to clutter your mobile device with any extra apps. Network check: The Internet and Wi-Fi speed tests have a brand new look. Results are helpful and easy to understand. You can add Hue lighting to your shared device list in the OnHub app. That will allow it to show up as a shared device at the on.here internal URL. When connected to an OnHub, just go there from any device with a web browser, and you'll be able to control your Philips Hue lights. Yes, you have to use the browser. The app is only used to add lights. Maybe this will change later when more smart home devices are added to OnHub.